Why do colors vary between different output devices? Under continued use, a monitor's white color temperature and brightness change gradually over time. Assume a monitor's color temperature was set to 5,000 K and its brightness to 100 cd/m2 when purchased. Since these values will change with time under continued use, a few months later the white will have become warmer and the brightness will have dimmed, to 4,500 K and 90 cd/m2 , respectively. 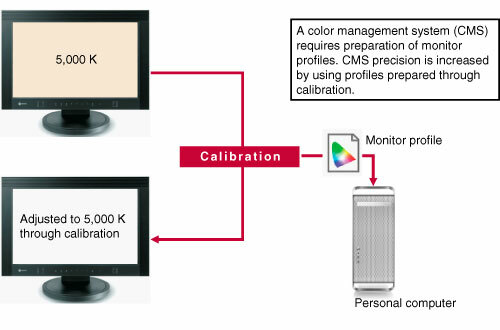 For this reason, calibration is important to return the monitor to its original state—i.e., to a color temperature of 5,000 K and a brightness of 100 cd/m2. 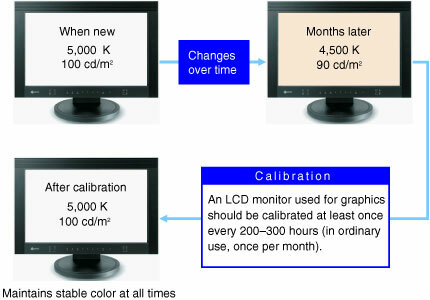 When using a monitor for graphics, stable color can be maintained at all times by conducting calibration at a frequency of once every 200–300 hours. A CMS is designed to enable uniform reproduction of colors on all devices. Building a CMS system starts with preparing profiles containing data on the color characteristics of each device. Some color profiles are provided standard by device manufacturers, but when higher precision is required a CMS tool can be used to prepare such profiles. These profiles can be used with the color engines included in personal-computer operating systems and other programs to share colors between devices. Colors can vary among individual monitors. Naturally, differences in the extent of use can lead to variations in changes over time. Even when new products have been configured identically, minor variations may occur. For this reason, calibration is important when adjusting colors to uniform levels, to absorb these individual differences. When implementing color management, profiles are required for the various monitors to be used. 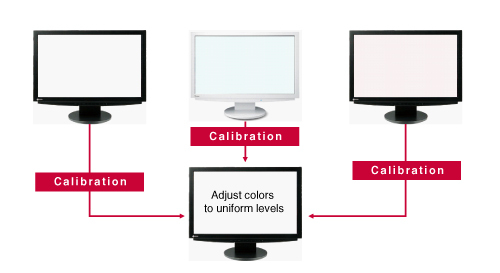 Since monitor profiles are prepared when conducting calibration, these profiles are configured in the personal computer's operating system. This configuration makes it possible to increase the precision of color management overall.